Looking for sports weekly round up from 3rd to 8th December 2018? For all the sports fans out there, here are all the match highlights and other details of the cricket matches that took place in this week in our sports weekly round up from 3rd to 8th December 2018. After a below-par batting performance in the first innings, India’s top order will be looking to up their game come tomorrow in the Adelaide test and take the match beyond Australia’s reach. Let’s take a look at best 3 knocks of India in Adelaide. Day 3 of the first test between Australia and India will see the Indian batting line-up step out to the crease at a point which can be called as a crucial period of the match for India. Before India and Australia resume a long and bitter cricketing rivalry come tomorrow, we dissect the top 3 bowlers from India’s side who will play an instrumental role for their side in the Adelaide Oval test. As India and Australia up their preparations for the first test match due to take place on 6 December, we take a look at the venue for the encounter, the Adelaide Oval. One of the greatest rivalries in international cricket is set to resume tomorrow with India and Australia taking to the pitch for the first test match of the four-match test series. With Australia sending out a David Warner and Steve Smith-less side to take on India, the visitors have by far the best chance of winning a test series in Australia, a feat they haven’t been able to achieve in 70 years. 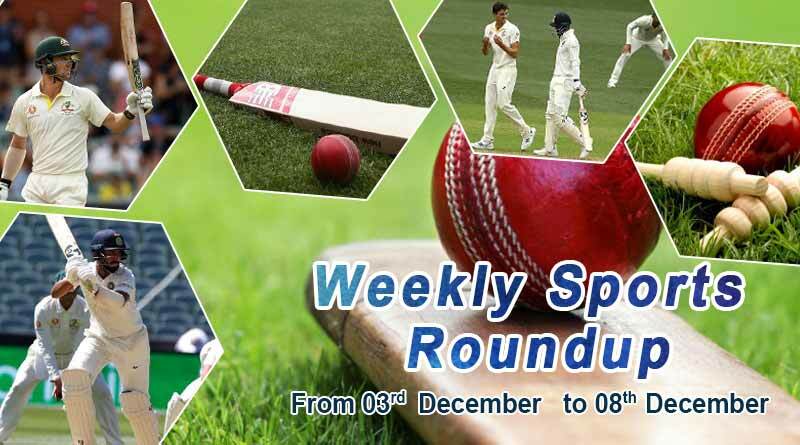 For more details on sports weekly round up from 3rd to 8th December 2018 and do Subscribe to our newsletter and follow us on Facebook, Twitter and Google+.